Mark S. Ramsey is a registered professional engineer with over 30 years of multi-disciplined research and drilling operations engineering experience, primarily in the oil and gas drilling industry. He was a founding member of the Technical Advisory Board of Cabot Specialty Fluids. He has chaired technical sessions for the SPE, IADC, and OTC. He has served on the SPE drilling editorial review committee, on the Drilling Technical Advisory Group of the Gas Research Institute, and represents clients at meetings of the DEA and the DEA-Europe. He chaired the Horizontal and Directional Drilling subcommittee of the AADE in Houston. He was an invited guest speaker of the Japan National Oil Corporation at their International Symposium on Horizontal Drilling. Mr. Ramsey was named a Charter Member of the Texas Tech Academy of Mechanical Engineers ("for outstanding contributions to the profession") and earned the "Distinguished Instructor Award" from Exxon while employed there. He has traveled the world extensively, teaching and working on six continents. He assisted Amoco in developing their successful Training to Reduce Unscheduled Events, (T.R.U.E. ), and spin-off workshops conducted worldwide. His Value Improvement Planning (VIP) workshops have saved drilling and completion operations literally millions of dollars in costs. Mark was elected to the Texas State Republican Executive Committee (SREC) in 2012, representing Senate District (Dan Patrick’s). Mark is a native of Houston, a fourth generation Texan. Mark has been involved in education related issues for years. He was invited by the Texas Sunset Commission to report on the Texas Education Agency when it was up for review, and several recommendations led to language in proposed legislation. He has actively participated in many state GOP conventions since 1980, and served as the Secretary of the State Organizations Committee in 2008. He was selected as the Platform Committee representative in 2010 and again in 2012. In 2010 he chaired the Education Subcommittee on the Platform and Resolutions Committee, and in 2012 chaired the Strengthening the Economy Subcommittee. 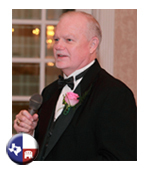 Mark is also a member of the Cherry Tree Republican club, an associate member of the Texas Tea Party of Republican Women, and a long-time member of the NRA and the Tomball Gun Club. Mark and his wife Pauline have been married for 32 years, and have three children. They worship at Woodsedge community church. You may reach Mr. Ramsey directly at: FirstnameLastname[at]TexasDrillingAssociates.com. Fundamental human rights—life, liberty, self-defense, etc.—are endowed by God and are protected by our Constitution. They are not fruits of others’ labor—welfare, health care, etc. Unalienable rights never impose on others' rights, whereas income redistribution schemes invariably do.